When it comes to health, nature is very generous. A host of plants offer a great deal of benefit for the body and the mind and yucca is one such plant. Studies have revealed that this common ornamental plant has a wide variety of uses from easing the pain of arthritis to boosting immunity and healing the skin. If you would like to find out more about this amazing plant, then please read on. Yucca or yucca root refers to one of 40 ornamental plants belonging to the Asparagaceae family. The plant is native to the deserts of Mexico and is found in warm regions of Central America and the USA while it can also be found growing in the West Indies. Also known by its scientific name – Yucca schidigera, this herbaceous plant is a member of the lily family. Yucca offers a wide variety of potential health benefits. Parts of the plant have long been used medicinally and can be added to the diet often in the form of a tea. The plant was used by the Native Americans for a wide variety of purposes including arthritis. It can also be applied topically to treat various skin conditions but is usually taken these days in supplementary form. Yucca is often confused with yuca which is an entirely different plant. The plants are often referred to interchangeably online but yuca or cassava is a completely different plant best known for its root vegetable that is used to make tapioca. Yucca has traditionally been regarded as an anti-inflammatory herb with extracts used to treat arthritis and inflammation. The plant is a good source of various phytochemicals including steroidal saponins with a diverse range of biological effects. It has long been postulated that saponins have anti-arthritic properties because they suppress intestinal protozoa which might play a part in joint inflammation. Yucca is also a good source of vitamin C, and various polyphenols including resveratrol and other stilbenes with known anti-inflammatory activity. These compounds are also known to exert powerful antioxidant actions which play a significant role in reducing inflammation as well as protecting the body from disease. The use of yucca to treat inflammation and arthritis is nothing new. 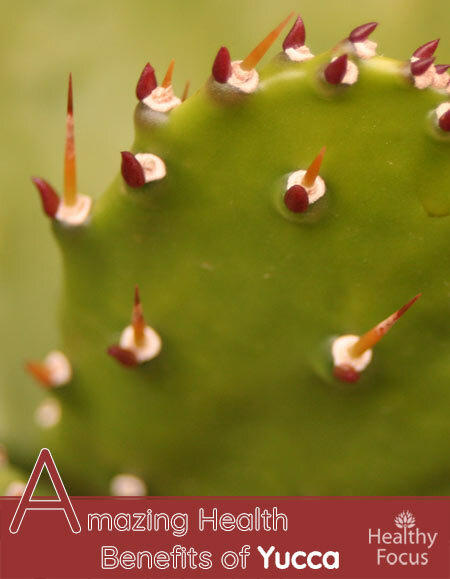 Like so many of the plants native to the USA, it has long been used by Native Americans to treat a variety of issues including arthritis symptoms. These days, yucca supplements are often used by people trying to treat painful arthritis symptoms and relieve inflammation in the joints. Research published in 2006 into the effects of yucca on arthritis offers some support for this traditional use. Yucca may also help boost overall health and protect against illness by giving the immune system a boost. Yucca is a rich source of vitamin C and several antioxidants that can bolster the immune system and benefit overall health. Vitamin C plays a number of roles in the body including stimulating the production of white blood cells that help the body to fight viruses and infection. The various antioxidants found in yucca can also help protect the body from harmful free radicals or oxidative damage. As well as its internal benefits, yucca has a number of potential uses for the skin. Studies have revealed that when applied topically, yucca can protect the skin from sun damage. Yucca contains folic acid which might help improve the overall health of the skin while the high levels of vitamin C found in the plant can help boost the skin’s collagen production keeping it strong and healthy. Yucca extracts are often added to soaps, lotions, creams and shampoos and can be applied to treat various skin conditions including skin infections, cuts, bites and dandruff. There is some evidence that the yucca plant may help keep blood sugar levels in check making it a good option for people with diabetes or people at risk of the disease. As we have already mentioned, yucca is an excellent source of various antioxidants such as vitamin C and resveratrol. It is important that we get as many antioxidants into our system as possible to help protect against the damaging effects of free radicals or oxidative stress. There is evidence that oxidative stress is responsible for a wide range of serious illnesses including a range of inflammatory conditions, heart disease and dementia. Some people have claimed that yucca can help reduce cholesterol naturally. It is hypothesized that the saponins found in the yucca plant bind onto cholesterol and prevent it from being absorbed by the intestines. Others have argued that there is no evidence to support the theory. Other studies have found no evidence to suggest that yucca helps reduce cholesterol and more tests are necessary before we can draw any firm conclusions. Yucca has also been used traditionally to help treat the hair and scalp and may be useful in preventing hair loss as well as common scalp issues like dandruff. Take a medium size yucca root and clean it thoroughly. Peel away the covering of the root. Break the yucca root into small pieces. Blend the small pieces of yucca root into a smooth pulp. The soap will be ready to use when it takes on a light amber color. You can then use the mixture on your hair or to wash your body. You should however perform a patch test to make sure you are not allergic to the plant. If you experience any irritation, redness or rash, stop using the plant immediately. Yucca can be applied topically in the form of shampoos or soaps and is also available in supplementary form including capsule, powder and liquid extracts. There are no exact dosage recommendations for yucca supplements so be sure to speak with your doctor to determine the safest and most effective dose. The yucca plant can also be used to make a healthy tea. Drinking two cups a day may help fight inflammation and reduce arthritis pains. To make a tea, take a yucca root, clean well and chop it up into fine pieces. Add a teaspoon or so of the chopped yucca to a cup of boiling water. Let it steep for at least 15 minutes and add honey to taste. What are the health benefits of yucca? Yucca contains various compounds including antioxidant phytochemicals and saponins that can help ease inflammation. Yucca is mostly uses to treat arthritis and rheumatism but can also be used to boost the immune system and to treat the skin and hair. Is Yucca the same as yuca? There is a great deal of confusion about yucca and yuca. The problem stems from the two plants often being used interchangeably online. Yucca refers to Yucca schidigera while yuca is a common name for a root vegetable also known as cassava. The plants are completely different and have very different health benefits though both are very healthy in their own right. Yucca extract is generally regarded as safe for internal and topical use use but there are some precautions you should be aware of. Yucca supplements may cause certain unwanted side effects including nausea, vomiting and upset stomach. There is no safety data regarding the use of yucca on women who are breastfeeding or pregnant. Women who are pregnant or breast feeding should stay on the side of caution and avoid using yucca supplements without their doctor’s supervision. Children should avoid using yucca extract. Yucca should not be used consecutively for more than 3 months at a time since it could interfere with the way the body absorbs certain nutrients. We do not have any information regarding interactions between yucca and any other medication. Make sure that you buy any yucca extracts from a reputable supplier and read any instructions carefully. If in doubt, speak with your doctor. Yucca is an ornamental plant native to Mexico and desert regions of the USA. It is often confused with the root vegetable – yuca or cassava. Yucca has anti-inflammatory and antioxidant properties. It is mostly used to help treat arthritis and joint pain but ,may also help treat diabetes and boost the skin’s health. It is available in supplementary form but can also be used to make a tea or applied topically in the form of a soap or shampoo.